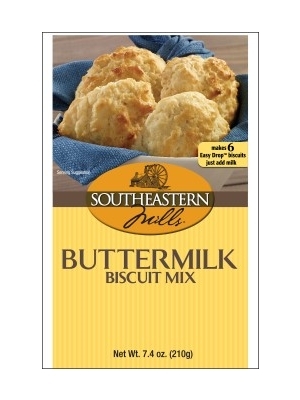 Southeastern Mills Buttermilk Biscuit Mix is a traditional drop biscuit with melt in your mouth flavor and texture. Makes 6 biscuits. Just add water! Bleached enriched wheat flour (wheat flour, niacin, reduced iron, thiamine mononitrate, riboflavin, folic acid), partially hydrogenated soybean oil, dried buttermilk, leavening (sodium bicarbonate, sodium aluminum phosphate, monocalcium phosphate), sugar, salt, dextrose, dried egg yolks, lactic acid. So good, fluffy and light. Simple to make, can be cooked in toaster oven for college students. We added dill to the mix.